You’re so welcome. This is truly amazing! You can’t see me but I’m dancing and singing (on the rain, you know Galicia, LOL!). Un millón de gracias por estar siempre ahí!!! Thank you so much!! 😘 Un abrazo!! I mean that sincerely. I appreciate the references, Dave. You’ll be on cloud 9 for a long time, I think. Hahaha! :-) Besides….there’s no deadline on celebrating. Chapel this is WONDERFUL news! And I’m not in the least bit way surprised!! Your blog has always filled me with great inspiration to be the ‘best version’ of myself & I know you inspire countless others in various ways!! You are deserving of this honor & I am blessed to have already valued your great services previously & present!! Hugs & Blessings!! WOW!! THANKS!! I was very surprised 😃 and I don’t see myself inspiring others like you say. Maybe I should look me in the mirror in a different way 😉 Thank you so much for your refreshing comment and unconditional support 😍 Big hugs and blessings!! Wow Chape, that’s incredible! I’m not surprised though, you have a great blog! Once my schedule slows down a bit I’ll be spending more time on it. OMG, that is so AWESOME! 10000000 CONGRATULATIONS my friend! I consider myself very fortunate to have you training me 😀 😀 😀 Hugs! Well done David, well deserved! This is so awesome congratulations! I have a business inquiry for you, what email can I reach you at? Love your blog, and this post is great! 😀 I will follow for sure. Top 100?! What an achievement! 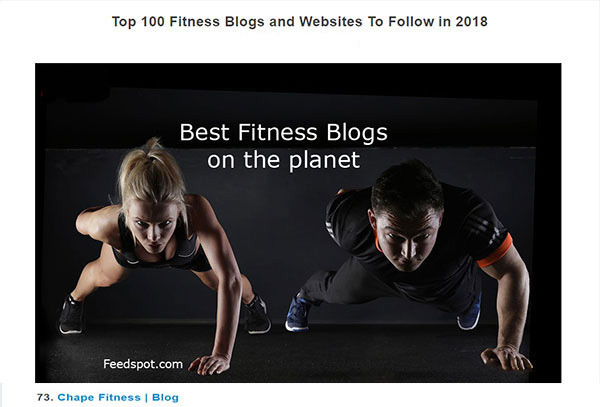 I have been reading your blogs and I like how you make all the fitness inspiration stories really personal, helping to connect people from all different backgrounds and circumstances through weight loss or just fitness! Awesome! congratulations! that was really a good thing for you and your business. This blog will become the source of encouragement for the beginners. This is fabulous news. Congrats are in order. congratulations! just shows hard work pays off! nice blog post, and congratulations for your hardwork’s fruit. keep updating your information in the future. I´ve just visited your website and let me tell you that I love your clean design and easy to read blog posts. One of the best blogs I´ve found recently. As you said on your blog “10 ways to make money online”: “It takes months and years to establish yourself as Blogger”. Do not be discouraged and keep up your great work! No need to thank me 😅 Hope the others reply, I can relate… Waiting for an answer to a comment/email… It’s not funny. By the way, I missed a follow button or a subscription form on your website 🤔?